This is a quick and easy-to-make lime pickle.This can be made instantly, with few lemons. These type of pickles are made in marriages and so we call it as Kalyana Elumichangai oorugai. Wash the lemons well. Heat water in a pan. 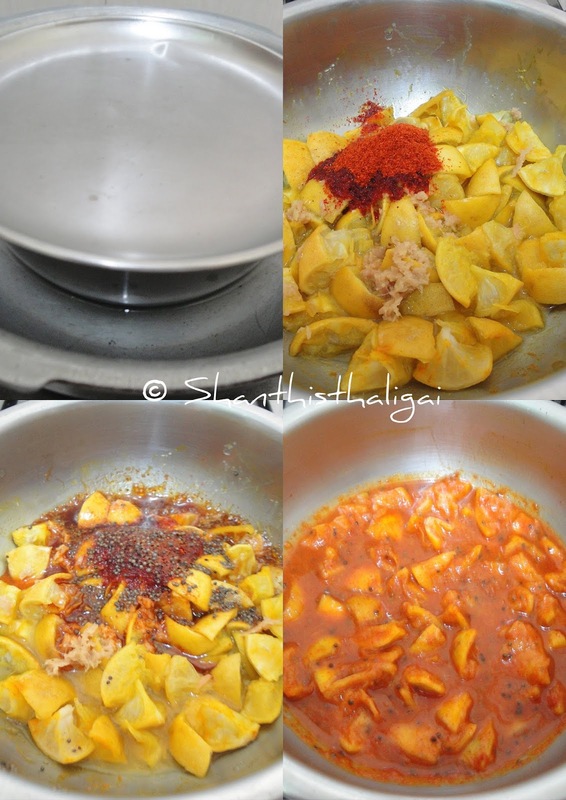 When water boils, put in whole lemons alongwith turmeric powder and allow it to boil for a couple of minutes, take off the stove and keep it covered. (Alternatively you can pressure cook for 2-3 whistles with an inner vessel. No need to add water if pressure cooked). When cool, take the lemon out from water and cut into desired size. Add grated ginger, chilli powder and salt. Heat gingelly oil in a kadai and add mustard seeds. When it crackles, add hing, switch off the stove, and pour it over the chilli powder. Mix well with a dry spoon and transfer it to a sterile glass bottle or ceramic jar. Goes well with curd rice. 1. When cut and cooked the pickle may become bitter. 2. Salt and chilli powder can be adjusted according to one's tastebuds and sourness of the lemon. Dry roasted fenugreek seeds powder can also be added. 3. This pickle is for immediate use. It can be used for 10-15 days when refrigerated.